The Necromorph infection is spreading through space, and only one man can contain it. Issac Clarke returns in Dead Space 2, and this time he's calling the shots. At least that's what it says in EA's official announcement, which comes hot on the heels of the teaser image that kept fans stumped for all of five minutes over the weekend. It sounds like Isaac will be large and in charge in the sequel, which promises new characters, plenty of zero-G fighting, and more space nightmares than you can shake a plasma cutter at. 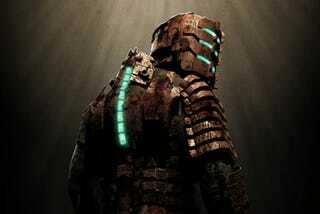 Is This Our First Look At Dead Space 2? "We're thrilled to jump back into the series, making the next chapter in Isaac's journey," added Steve Papoutsis, Executive Producer of Dead Space 2. "The infection continues to spread throughout space and our hero Isaac Clarke is the only person able to contain it. There are still loads of Necromorphs that need killing. In Dead Space 2, not everything is exactly as it seems. Expect plot twists that will surprise you and a huge cast of twisted, disgusting monsters that are sure to scare the daylights out of you." And that's all we get. I just want to see how they got Isaac out of the predicament he was in at the end of the first game. I don't want to spoil anything, but that sure was a whole lot of monkeys.